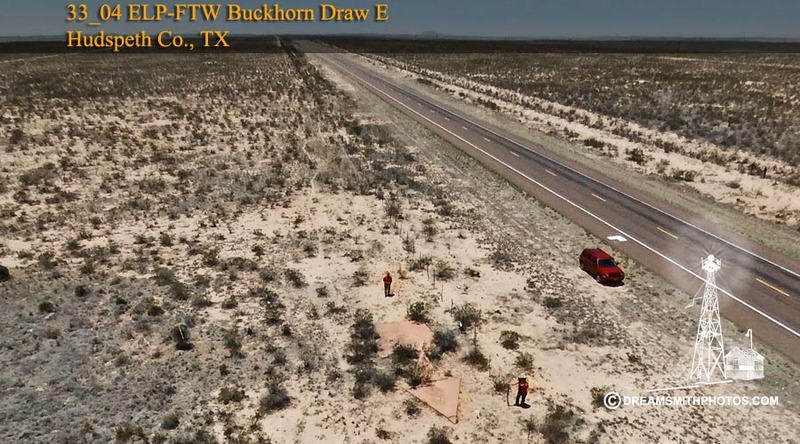 The Buckhorn Draw East #4 Arrow is located approximately 25 miles west of the Salt Flat Café, right along the south side of Highway 62. It took us two passes before we were able to locate it, as it can’t be seen at all from the highway. All that remains of the arrow is the base where the beacon once stood and the arrow itself, both of which are in very good condition. The portion that is still there is 35 feet in length. The pilot would approach the tail of the arrow on a compass heading of 100° (E), and then exit the arrow on a compass heading of 100°, also basically East. 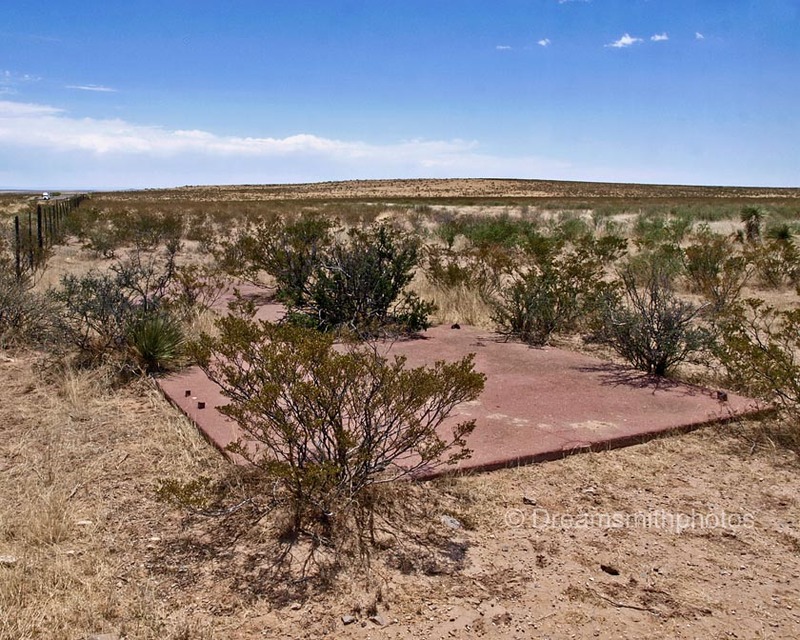 Hudspeth, Texas: Department of Commerce intermediate field, site 4, El Paso-Fort Worth Airway. 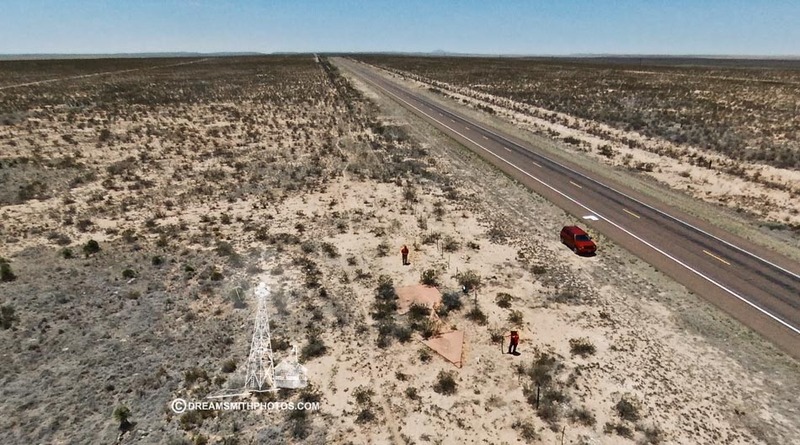 Fifty miles E. of El Paso. Altitude, 4,500 feet. L shape, 96 acres, dirt, level, natural drainage; two landing strips, 3,000 by 550 feet N/S., 3,960 by 550 feet E./W. Directional arrow marked "4 ELP-FTW" Beacon, boundary, and approach lights. Beacon, 36-inch rotating, showing alternate green and white flashes. No servicing facilities. Hudspeth.—Department of Commerce intermediate field, site 4, El Paso-Fort Worth Airway. Fifty miles E. of El Paso. Altitude, 4,500 feet. L shape, 96 acres, sand, level, natural drainage; two landing strips, 2,950 by 550 feet N./S., 3,960 by 550 feet E./W. Directional arrow marked "4 ELP-FTW." Beacon, boundary, and approach lights. Beacon, 36-inch rotating, showing alternate green and white flashes. No servicing facilities.